It’s that time again. 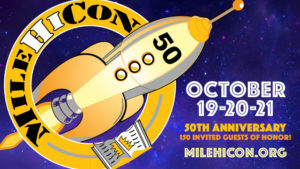 MileHiCon, the Denver regional science-fiction convention, at the Denver Tech Center Hyatt-Regency hotel is celebrating its 50th the weekend of October 19-21. I will be there for the weekend, including panels Friday afternoon and Saturday evening and the mass autographing Saturday afternoon. I’ll also have books at one of the author tables in the lobby. Find me and say “hi”. The Colorado Christmas Gift Show will have a booth for the Colorado Authors’ League (CAL), which will have my books available. (I’ll also be at the booth for a couple of shifts, I don’t know exactly when.) The Show is the weekend of November 2-4 at the Denver Merchandise Mart. I’m into the final editing stage for the Kakuloa book. This will be the first of three: Kakuloa: A Rising Tide, Kakuloa: The Downhill Slide and Kakuloa: Revivified (that last title may change). These span the gap between the Alpha Centauri series (you can think of them as books 4, 5 and 6 in that series, although the original characters make only minor appearances, if any) and The Chara Talisman. I can’t promise it for either of the above events, but I’m hoping. Definitely by December. And the next Carson & Roberts is in progress too.